Suwanee, Ga. – Mimaki USA, a leading manufacturer of wide-format inkjet printers and cutters, has installed the first 3DUJ-553 3D printer in the Americas at Pictographics in Las Vegas. The Mimaki 3DUJ-553 printer offers an unprecedented printing experience with a number of enhancements to produce objects with high definition, fine detail and in full color up to 20 inches wide by 20 inches deep and 12 inches high. It is a color-managed device with more than 10 million possible color combinations for photorealistic output. Clear ink is available for creating translucent colors. It uses water-soluble support material that is easy to remove, maintaining fine details. The 3DUJ-553 printer is a fully ICC-compliant, color managed device that can produce more than 10 million color combinations and achieve 90% of SWOP colors. It is the only color managed 3D printer currently available offering users the ability to reproduce a tonal range far surpassing that of any other 3D printer and enabling them to utilize 2D and 3D in tandem for photographic applications. The ability to create highly color-accurate objects and prototypes that can be reproduced without the need for manual hand coloring reduces finishing and prototyping times drastically. Mimaki’s printer and ink technologies enable high quality 3D printing that can create products that are delicate, extremely precise and incredibly realistic. The 3DUJ-553 printer is also able to utilize clear inks that can be jetted independently or combined with colored ink to create translucent objects. Unlike many other 3D materials, the Mimaki water-soluble support material does not require lye or other harsh chemicals but is easily removed with water alone. Easy removal of the support material means that end users can create models and products with fine details and intricate designs without affecting the final design. 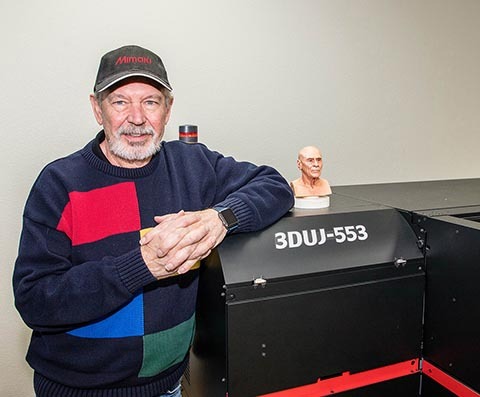 Craig Miller, President and CEO of Pictographics, with the Mimaki 3DUJ-553 3D printer.